Kids love collecting things: shells, stones, coins, marbles, stuffies. Like most, collecting starts quite naturally, one here, another there, and soon the collection grows. What they do with that collection is as variable as the items collected. The lovely Jerome of The Word Collector takes a unique perspective on his collecting and one to which all collectors should aspire. Jerome loves picking up words wherever he finds them: those he hears, words he sees and some he reads. Why he is drawn to a word ranges from those that grab his attention because of their sounds or their meaning. 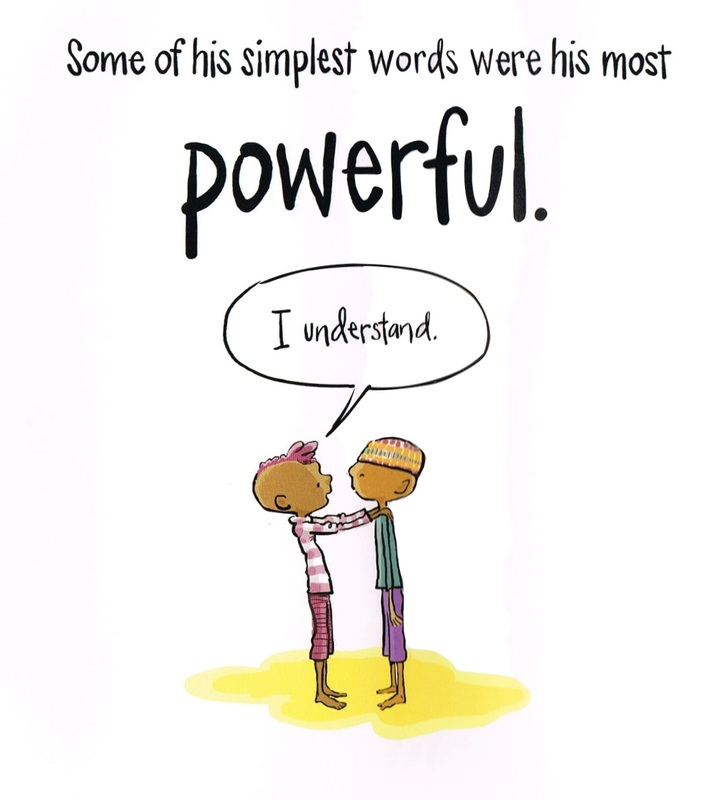 Regardless he amasses quite a collection of words which he needs to organize. But while transporting a colossal stack of books and boxes of his organized words, he slips and they tumble into a chaotic mess. But Jerome sees beauty in the unusual combinations of words which he translates into poetry and music and by expressing to others. By recognizing the profound impact his words can have on how others think, feel and dream, Jerome expands on sharing his growing collection. 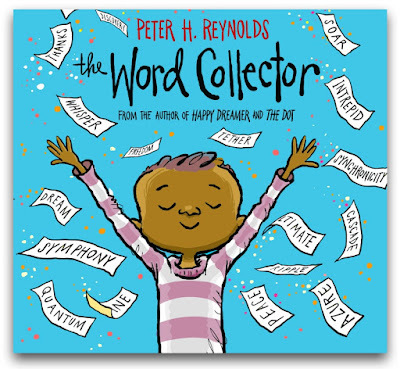 Squirrelling away a collection of treasures brings a certain joy but Peter H. Reynolds recognizes that a shared collection is a better collection. No longer is the collection the realm of the individual but instead it becomes part of a community of aesthetes who appreciate the collection's elements in the myriad of ways. 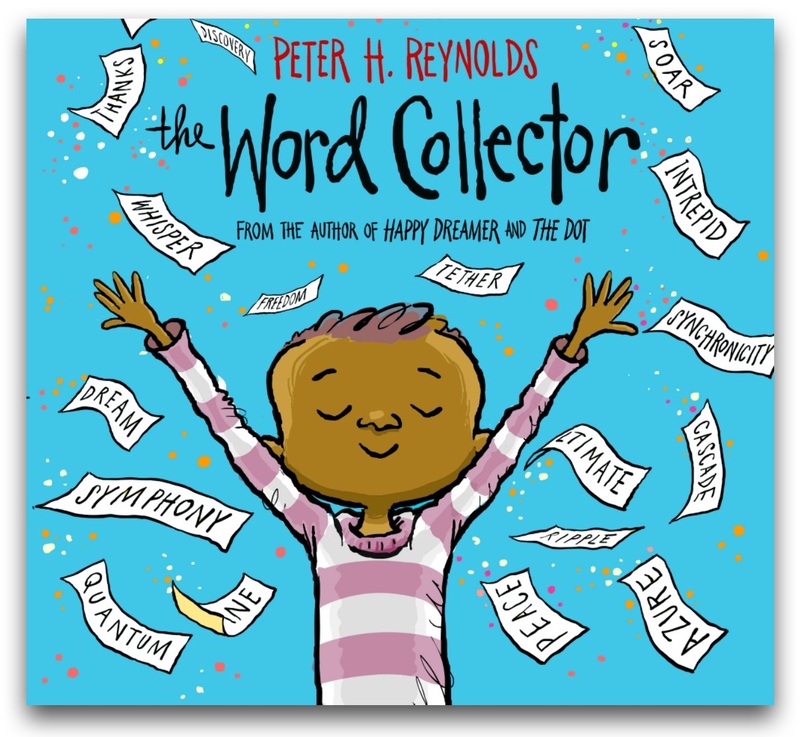 The illustration of countless and diverse children grabbing words like "honor", "resilience", "hope" and "promise" supports Peter H. Reynolds' message of appreciation and creativity and empathy. 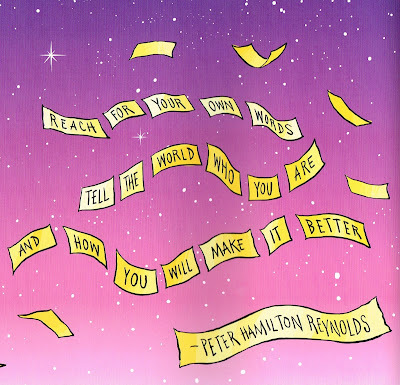 Words are powerful and all the more for being shared in thoughtful texts like The Word Collector and illustrated with cheerful artwork of Jerome and others amongst the fluttering murmurations of words. 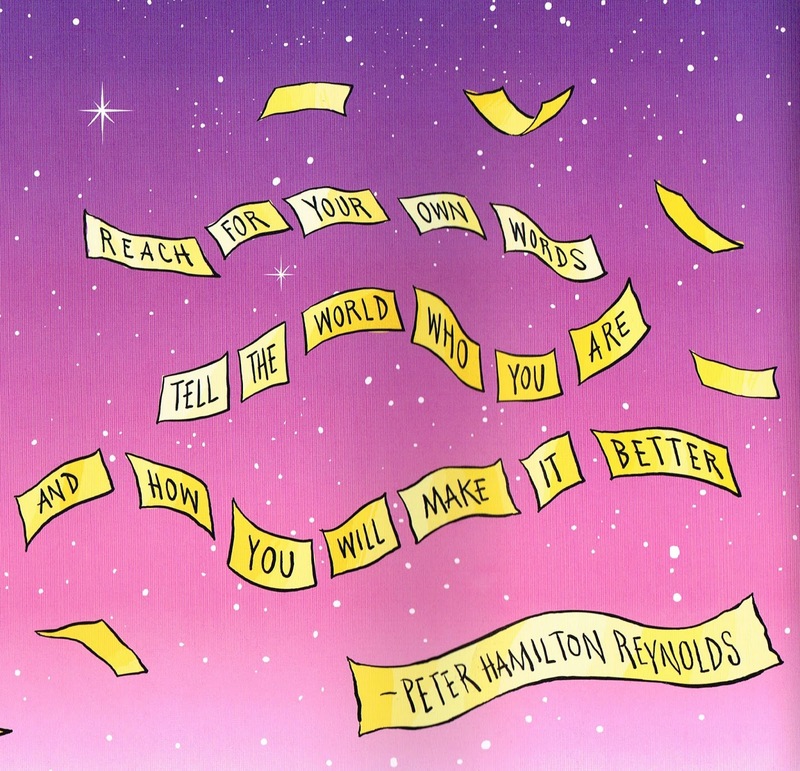 I'll leave the final words to author-illustrator Peter H. Reynolds whose own words inspire readers to more.